LOS ANGELES — The city police and fire officials, as well as department of transportation representatives confirmed Wednesday that the actual number of participants in the April 24 March For Justice to commemorate the Armenian Genocide Centennial eclipsed the initial 130,000 reported by the Los Angeles Times. The agencies place the official total at more than 160,000. 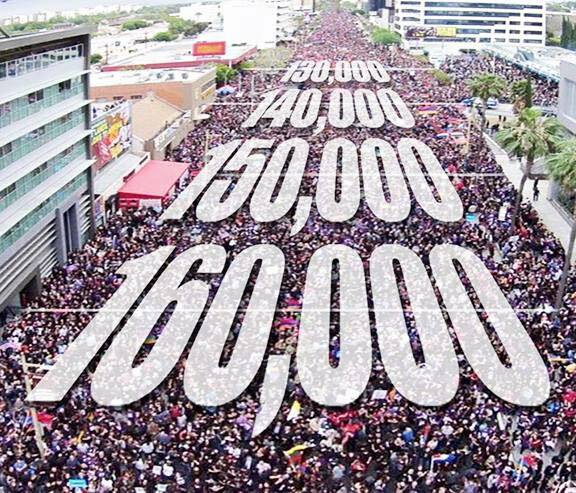 Following the march, which was one of the largest in Los Angeles history, the Los Angeles police, fire and transportation departments reviewed the footage captured by the city helicopters and based on a commonly-used equation, which is used to tabulate crowd numbers, concluded that the actual number of participants exceeded 160,000. Aram Sahakian, Senior Transportation Engineer In Charge of Special Traffic Operations and Emergency Response at the Los Angeles Department of Transportation, confirmed the new tally to officials of the Armenian Genocide Centennial Committee of Western US, which organized the March For Justice as the sole commemorative event in Los Angeles on April 24. The police, fire and transportation agencies also commended and praised the March For Justice organizing committee for their diligence in securing volunteer monitors, who were for the most part members of the Armenian Youth Federation, and who, along the route of the march, worked with law enforcement and transportation officials to ensure the smooth progression of the event. The March For Justice started at the intersection of Western Avenue and Sunset Boulevard, where an opening program featuring remarks by LA Mayor Eric Garcetti, California Senate President Pro Tempore Kevin de Leon and Los Angeles City Councilman Mitch O’Farrell kicked off the march. Marchers headed west on Sunset Boulevard, then south on La Brea Avenue and then west on Wilshire Boulevard, where the crowd gathered in front of the Turkish Consulate building for a rally that included remarks by Representative Adam Schiff and Los Angeles City Councilmembers Paul Krekorian and Paul Koretz, whose passionate speeches elevated the event’s importance and highlighted the need for justice for the Armenian Genocide.